Optimal folate and B vitamin intake is associated with healthy neurological function as well as cardiovascular support. 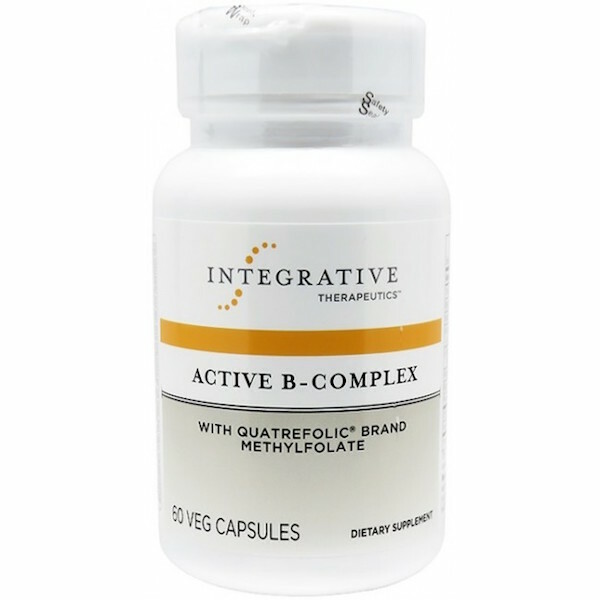 Active B-Complex is a balanced, hypoallergenic B-complex formula featuring active forms of vitamins B1, B2, B6, and B12. It also contains Quatrefolic brand Methylfolate, a reduced and bioactive form of folic acid. The Preferred Form of Folate Because humans cannot synthesize folates, they must obtain them from dietary sources. (6S)-5-methyl-tetrahydrofolate (known as 5-MTHF or L-methylfolate) is the predominant form of dietary folate and the only species normally found in the circulation, and thus it is the folate normally transported into peripheral tissues for use in cellular metabolism. Cellular metabolism of L-methylfolate begins with conversion to unsubstituted tetrahydrofolate in what is known as the “methylation cycle.” There is some evidence that the metabolic capacity of intestinal cells to reduce folic acid may be limited in some individuals. Quatrefolic is a novel form of folate that is stabilized as a salt of glucosamine. It is estimated to be 100 times more soluble than the commonly used calcium salt of 5-MTHF. Supplementation with the folate derivative is thought to confer the beneficial effects associated with folic acid, but without requiring the body to convert it from folic acid. Recommendations: Take 1 or 2 capsules daily, or as recommended by your healthcare professional. If pregnant, nursing, or taking prescription drugs, consult your healthcare professional prior to use.